New figures released today show fires in the capital involving white goods have cost the economy more than £118 million over the last five years. 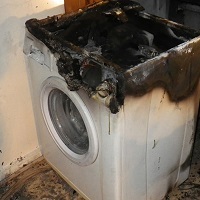 The data has been published as part of London Fire Brigade's Total Recalls campaign, which aims to make sure the public are better protected from potentially lethal faulty white goods. Since 2011, London's firefighters have attended 2,072 white goods related fires - almost one blaze a day. The Brigade has calculated that each domestic fire costs the economy an estimated £57,000, which takes into account a number of factors including damage caused and the cost of the fire service response. The statistics from 1 January 2011 until 30 September this year show that Croydon is the borough most affected by these fires, with 114 at a cost of over £6.5 million. The Brigade's campaign has been endorsed by Hammersmith MP, Andy Slaughter, who represents Shepherd's Bush where there was a major fire involving a tumble dryer in August 2016. Mr Slaughter has tabled an Early Day Motion, which expresses deep concern about the potential fire risk of white goods such as washing machines, tumble dryers, and the inadequacies of product recalls. You can support our campaign to make white goods safer by asking your MP to sign the early day motion. The London Fire Commissioner has written to every London MP urging them to back the campaign. The Brigade is also asking people to write to their MP about Total Recalls and share their stories about white goods fires or concerns they have. London Fire Commissioner Ron Dobson said: "The recent tumble dryer blaze in Shepherd's Bush showed the devastation white goods fires can cause and now we see the huge cost of them to the public purse. "There is a serious lack of awareness about the potential dangers posed by faulty white goods and manufacturers are lagging far behind when it comes to prioritising fire resistance in their designs. "We want politicians and members of the public to share our campaign to make people better informed about the dangers white goods can pose in their homes."